Gravity has a big presence in Japan and I have come across some of his videos while reading up on their boards. Really amazing what he could do with those long boards. It’s a bit chilly but I have been thoroughly enjoying skating on the flat with my 33” x 9.25” deck with 19” WB. Taking it easy but definitely getting more and more comfortable. I am aware of my bad foot but it is not holding me back at all. I got some Vans Sk8 Pro’s and ditched my plastic arch supports. That has been a revelation for sure. I feel like I am skating with magic ninja feet right now. There is a bit of extra back ache afterwards without the supports but it doesn’t outweigh the benefits so far. Thank you 70sSkater for the shoes advice! The Gas Head II arrives next week. It should keep me busy until I get to the US for a visit in March and can retrieve the Quad 12 waiting for me there. (Cheers to Frank on eBay and Bluflame!) Again, thank you all for the recommendations. I definitely feel like I got two good boards for my purposes. I’ll have a decent amount of time to focus on the GHII and then can start working with the Q12. Very stoked! I have been reading and searching quite a bit about wheels and have identified a few possibilities that I would like to see if I can get some feedback on. I plan to stay on the flat for a while to build strength and skills before venturing onto a ramp again. I was thinking it would be useful to get a wheel size/shape/brand that comes in different duros so that I could get a good feel for how the board rides on the flat with a lower durometer (~78) and then move up a harder one (~90-92) when I start back on the ramp. Also, a little background might help. I was on Indy 169s and 99a 60mm Classic Spitfires when I fell and cracked my ankle. It definitely felt like a mixture of tipping and slipping when it happened. The ramp is old slick wood and often pretty dusty, but I am sure the main culprit was my lack of balance. Most everyone there skates on hard wheels. Still, as a result, I am apprehensive about narrow wheels at the moment. Because of that I have left off the Powell skull and sword and the Rainskates. I keep thinking that I should have a wider CP (~34), but if I should go with a narrower base (~20), then maybe a very small wheel would be best (~56), hence the smaller Rictas. I have tried to digest the specific advice I received before and what I have been reading, but do want to see where my own thinking might be off and if any of these specific wheels would be well matched for what I want to do. FWIW, I run Indy 159's with Bones medium bushings and BDS Dragons at 99a on my Gashead. I am 5'9" 200lbs. and it is an incredibly fun set up for riding bowls and transition. It has a very surfy feel that turns off the tail. I would go with Bones hards and softer wheels if I were to ride it on hills but I don't. I think 169's with wheels that have some offset would be the way to go. I wouldn't use 215's on the gashead unless I was running a center set narrow wheel which to me looks odd (but it's not all about the looks). If you're going to stick with the Indy 215s, you probably want to go with a center set wheel. I would take another look at the Rainskates. You can get different duros in essentially the same wheel shape. If a ramp, or even concrete, is dusty, even soft wheels will slide out. I don't think a little more contact patch is going to make any difference. I haven't used the No Skoolz, but I understand they are pretty good wheels. Of the ones you listed, I might go with those. The Rictas could be fine as well. I am using 169s on my longboards. On the Gas Head II, I have very soft, but fast Mellow Yellow Dubcons. The track width for that setup is 10 3/8". On the Hammerhead longboard, I am using offset 60mm Skaterbuilt Poolside Favors. The track width for that setup is 9 3/16". Of the two, for park riding, I like the Hammerhead setup better. The smaller wheels are quicker and really cut down the swing weight. On my Holt deck, which is the same width as the Gas Head, I have 215s with center set BDS 62mm Jujus. Seems right to me for a 10.5 inch deck. You could also go with center set Mini Dubs on a 10.5" deck if you want a little more contact patch, but you'll be adding some weight. Because BDS wheels aren't being made and are kind of hard to get I'm going to suggest you look at Rainskates wheels. Available in several different sizes and durometers you'll find all the variation you want within the range. They were originally designed to have a bigger footprint and have evolved with single and double cuts to back and front faces to reduce rolling resistance and give better roll on roll off on coping. I have several sets and apart from the very hardest formula 100a stuff they have always been very grippy even in the 98a duro. They are quite liked by some of the UK riders in the 95a Duro for decent speed with grip on wood ramps and in slippery bowls. All the wheels have cores which is good for saving weight and for keeping your bearings in line. Edit - Didn't read 70's comments before I typed that. I have orange 85a Rainskates on 215`s on a Gashead Longboard. Makes for a great cruiser on the rough 40 year old concrete at my local skatepark. Thank you all for the input. I have looked at the chart with the measurements for the truck and BDS wheel pairings, but the side by side pictures are very helpful to get a better sense of what different types of wheels would look like with 169s and 215s. Those are some fine rides too, 70sSkater! For now, I will probably start with some of the softer ABECs on the flat. Even if it is just psychological, I want to move on from the bigger longboard wheels to something with a wide-ish contact. I will also get the 85a Rainskates and give those a shot after a bit. If that goes well, I will work my up to the harder duro Rainstakes for the ramp. I am definitely open to using the 169s with the GasHead but the centerset wheels I was looking at seemed to fit better with the 215s. Even the sideset Kryptonics would probably be under 10” with the 169s and I was really wanting to hit close to 10.5”. I understand how tricky it could be, but for sure I will see if I can find some BDS wheels a little later. Especially for the quad 12, it would be sweet to have a set. Am I right for targeting the 92a duros? I realize that might be a tad slow but I have come across several different posts recommending that as a good starting point for ramps. I was thinking I would start there first and then move up to 95a. stories like yours bring stoke to the rest of us too, so thank you! Saw Brad Edwards at a slide contest & later at a local skatepark. I always wondered what wheels he typically used, didn't look like any of the Gravity wheels. He told me he used the 98a Rainskates Yellowjackets for just about everything, unless it was super rough & then he would use the 85a's. He's on the Yellowjackets in that posted video. Amazing what he could do on his 40" longboard. Whether on banks, ramps, bowls, pools, etc, he could toss that thing around like a popsicle, but had such a flowing, smooth style. Hard to believe he's gone. RIP, Brad. @ Lox: hadn't heard you were injured, glad to hear you're healing up & getting back on the board. Finally able to get my hands on my first official BDS deck—the GasHead II. Man, what a sweet piece of craftsmanship. So bloody cool from every angle—the shape, the dimensions, the concave, the art, and of course, how it rides. It really feels good underfoot and just does not at all feel like a 38” deck. I know this is old news to everyone here, but it is brand spanking new to me! I put some rails on it and set it up with the Indy 215s/Bones hards and some Bones 59mm Rough Riders that I had with about 3/8” of stacked risers at first. I then switched to the ABEC No Skools 81a 65mm once those arrived and upped the risers to about 5/8”. When I am riding in front of my house with some smooth road and a little slope to work with, it is like riding a magic carpet. Just feels so right. 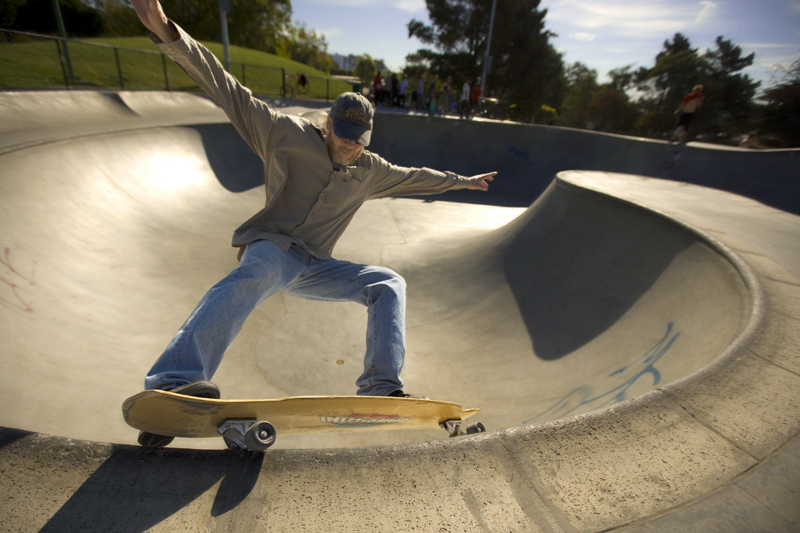 When I am on the flat at the park while my kid is working on the ramps, I have a lot less space, the terrain is rougher and I have to push much more often. The extra riser height is more noticeable and a little less than ideal, though doable. I am having some trouble smoothly adjusting my feet on the board from a riding stance (with my back foot on the tail and my front foot angled and close to perpendicular with the board) to a pushing stance (moving my back foot off the tail and sliding it forward up the board, moving my front foot parallel and then putting my back foot to the ground for the push). When I am trying to reposition my front foot, I keep finding my weight too far back and the front wheels start to lift off the ground. I feel like I have to pull my back foot much further forward than I am used to and the process takes a little to long for a quick push and feels awkward. Four or five sessions in, I cannot seem to make any headway in doing all the foot adjustments smoothly for a quick push. I am sure it is 95% my crappy skills but am guessing the extended wheelbase and accompanying real estate is raising the difficulty level of this basic maneuver. At this point, I am not sure if I am overthinking things or just not done enough repetitions or if some other fundamental problem is causing the trouble. Does any of the above sound typical or better yet, easily solvable? If you're just cruising, you don't necessarily need to have your back foot on the kicktail. 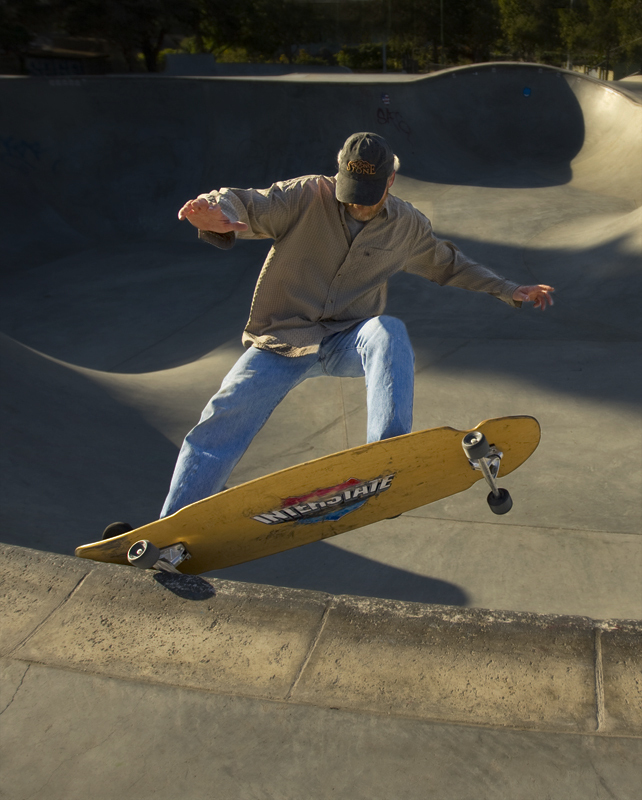 So, you can put your front foot near the front truck bolts, push and then put your back foot just about anywhere on the board that is comfortable to you. But, if you're park riding and need to use the kicktail, you just have to get used to a wider stance. It will come with time. Very often, I bring different boards to the park to ride. So, I might bring one of my longboards and then a couple other boards with smaller wheelbases. When I do that, I have found it much better to start on the longboard and then work my way down in wheelbase. If I do it the other way, the longboard feels so sluggish and unwieldy compared to the shorter wheelbase boards I was riding earlier that it's almost impossible to ride the longboard at the end of the session. I think you're finding out why we were suggesting an 18" wheelbase board as your starting point. 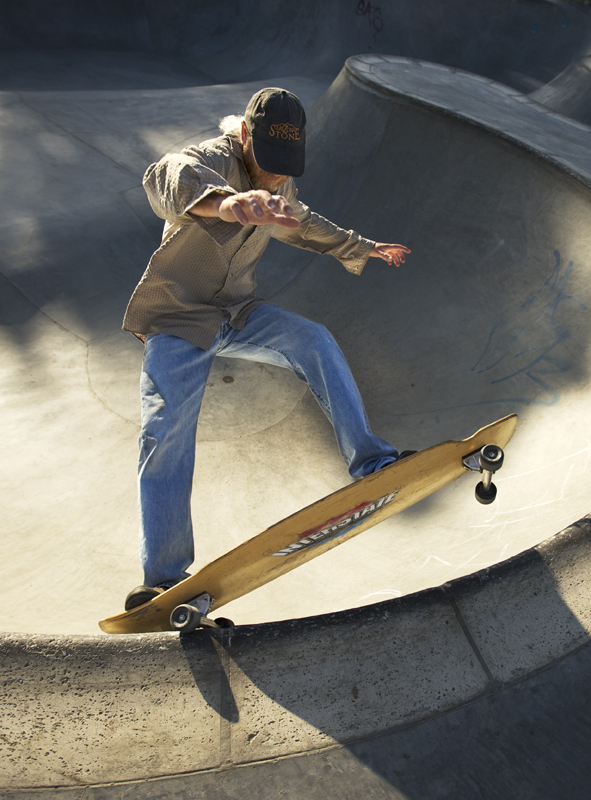 It's just easier to control and your stance on the board will feel more natural. Nothing wrong with the Gas Head II. It's a great board and, no doubt, you will grow into it. And, like you said, it really doesn't feel like a 38" board.